Reverse: Bull-calf walking left, Q VOCONIVS above, VITVLVS in exergue. History: This postumous coin was struck by the moneyer Quintus Voconius Vitulus. 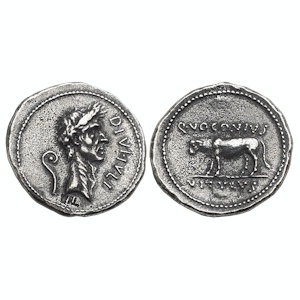 This coin is dedicated to Julius Caesar who was assasinated in 44 BC. Caesar was deified after a senate resoultion in 42 BC and this is shown in the title to the right of his bust, DIVI IVLI. The lituus behind his bust shows that he was a member of the priestly augurs. The lituus was a crooked wand used as a cult instrument in ancient Roman religion of augurs to mark out a ritual space in the sky. The reverse of a standing calf is strictly personal, being a punning allusion to Vitulus, which literally means calf.